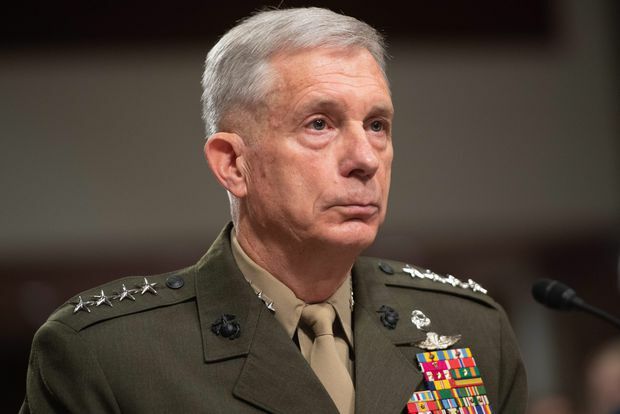 Commander of United States Africa Command, General Thomas Waldhauser, testifies during a US Senate Armed Services Committee hearing on Capitol Hill in Washington, DC, on Feb. 7, 2019. The testimony this week by General Thomas Waldhauser, head of the U.S. military command for Africa, was a glimpse into the emerging world view of President Donald Trump’s administration, where Africa is seen largely as a battleground for superpower rivalry. Gen. Waldhauser, testifying before a U.S. Senate committee, spelled out what he sees as evidence of the “harmful influence of non-African players” on the African continent – while excluding his own country from that description. One of the U.S. strategic goals, he said, is to “decrease the potential for Africa to become a failed continent.” His words sparked anger on social media among many Africans, who saw it as a highly exaggerated and pessimistic view of their continent. Some noted that U.S. military intervention in Libya had contributed to the failure of that North African country. China and Russia are both making inroads across Africa, the U.S. commander told the Senate committee. “The Chinese bring the money and the Russians bring the muscle,” he said, quoting a Congolese politician and calling it an accurate description. Most of China’s influence in Africa has been economic, especially in ports and other infrastructure, but it is increasingly sending peacekeeping troops and other forces, Gen. Waldhauser said. Russia, meanwhile, is targeting countries where the United States has less influence, Gen. Waldhauser said. “I think it’s clear that their strategy along the northern part of Africa … is to have influence inside Libya,” he said. He said Russia is using its historical links to former Libyan dictator Moammar Gadhafi, along with Libya’s old debts to Moscow, as a way of winning economic and military contracts, reviving arms sales and gaining control of Libyan oil and Libyan territory on the Mediterranean Sea. In the Central African Republic, he said, a Kremlin-connected company has deployed 175 Russian mercenaries to support the government, the national army is being trained by Russian military contractors and a Russian civilian has been appointed as the President’s national security adviser. Russia is exporting weapons to the country in exchange for mineral rights at a fraction of their real value, Gen. Waldhauser said. “Russia is a growing challenge and has taken a more militaristic approach in Africa,” he said in his written submission to the committee. Gen. Waldhauser acknowledged, however, that the United States has its own extensive military presence across Africa, including a total of 7,000 soldiers, military contractors and civilian employees. In Somalia, the Pentagon has already launched 12 air strikes against alleged terrorist targets in the first six weeks of this year, after launching 47 air strikes last year, he said. The United States reportedly has 34 military bases and other military outposts across Africa.